Cory Thompson sits outside his home in Carcross, Yukon. In early 2014, Nelson Lepine was at a loss. As the former director of infrastructure for Carcross/Tagish First Nation, he was at a standstill with an angry member of his community. The man paid a visit to Lepine’s workplace, frustrated by the state of his life in Carcross and looking for someone to blame. By the time Lepine walked down to his front lobby to meet him, he had formed an idea in his mind: creating opportunities for his community through an innovative construction-based project. He wanted to launch a tiny home-building program that would teach participants work and life skills — a process known as capacity building, which equips citizens with new skills to better themselves and their community. Within three months, Lepine’s plan was up and running. The result was a small subdivision of three tiny homes in which community members could live. Nelson Lepine drove the Tiny Houses Carpentry Training Project forward, which ultimately served as a capacity building catalyst within the Carcross/Tagish First Nation. Today, he works for the Carcross/Tagish Management Corporation. In the end, the man who prompted the project didn’t join the program, but it spurred job creation and development opportunities for 15 people eager to learn the trade. In Carcross, the ripple effects of the program are still being felt. The tiny home movement initially began as a way to embrace the minimalist lifestyle and to encourage less consumption. In the Yukon, the movement has provided a niche solution to a discriminatory housing market and limited job prospects for First Nations people. According to 2016 data from a Whitehorse Point-in-Time count, 78 per cent of people identifying as homeless were Indigenous, a figure much higher than they are represented in the general population. The first of these Yukon-based tiny home projects kicked off in 2012 when the Blood Ties Four Directions Centre — a non-profit that provides services for people with Hepatitis C and HIV/AIDS — built the Steve Cardiff Tiny House. Named after a local NDP MLA, the home served as a temporary roof for the organization’s clients, many of whom are First Nation. This year, Blood Ties is building four new units to create Whitehorse’s first tiny home social housing community. The original Steve Cardiff Tiny House has been in storage since 2016. Photos provided by Patricia Bacon. 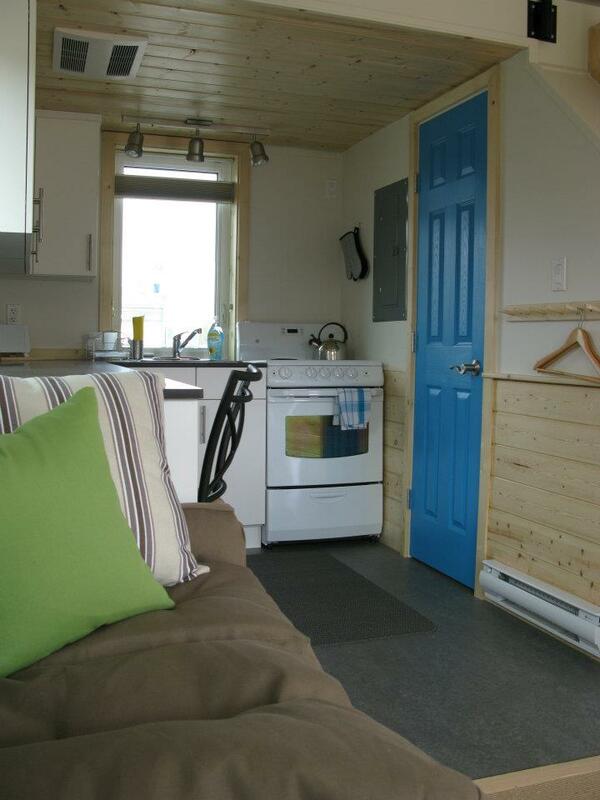 The tiny home movement has built momentum in First Nation communities across Canada. The Nuxalk Nation in British Columbia erected five tiny homes for at-risk men earlier this year and soon after, the Piikani Nation in Alberta started a skill-learning program similar to Lepine’s project. Currently underway, a Secwepemc Nation activist group — also known as the Tiny House Warriors — is building 10 tiny homes along the 518-kilometre planned Trans Mountain pipeline route in an attempt to block access to the site. 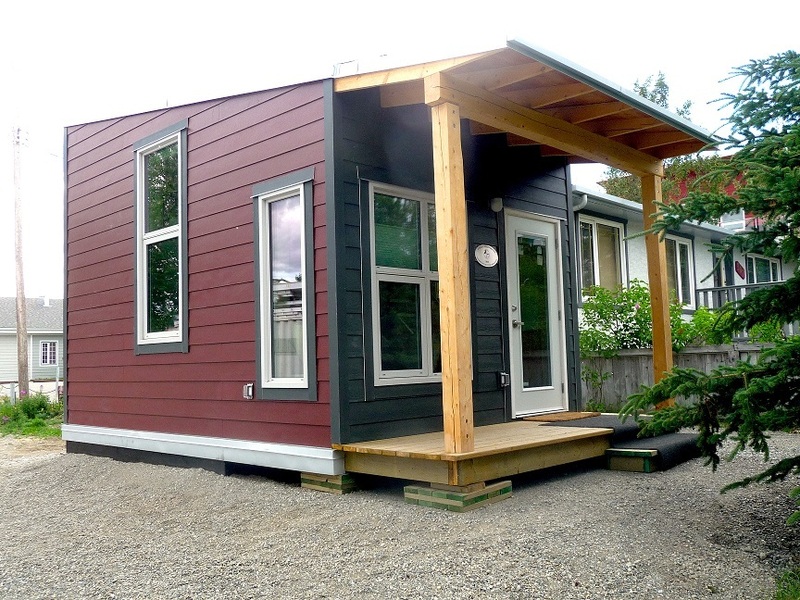 The tiny home trend is also moving to the foreground in a time when the territorial government is also investing in affordable multi-unit buildings, including a housing-first complex in Whitehorse featuring bachelor-style units. In the Yukon, tiny homes — some smaller in size than the average school bus — are shaping up to be a solution for housing issues often sparked by costly land. “There’s a massive, massive overrepresentation of Indigenous people in our homeless population," says Kate Mechan of the Yukon Anti-Poverty Coalition. "When you see the numbers actually on paper, it’s quite staggering. It’s not surprising, but it actually makes me feel sick to know how we’re failing people." Not only is land a pricey purchase, but affordable rental units are a rarity, often snapped up by families or those with stable jobs. Compounding the crisis, Mechan says those with lower incomes, lack of identification, unreliable contact information and a host of physical and mental health concerns are often frozen out of housing opportunities. She points to conversations that need to happen between First Nation and territorial governments to ensure no one falls through the gap. “One of our first steps in implementation is to start developing these relationships with individual First Nations and also communities to get a sense of how much of a priority it is,” she says, adding that ensuring affordable housing is a goal to bring people back to their home communities. Homecoming is an experience Cory Thompson, 49, lived through nine years ago. Thompson, a steel stud framer who grew up in Abbotsford, B.C., decided to move to his mother’s First Nation in Carcross after she died. He had never lived there before, but visited on numerous occasions as a child. Thompson came to Carcross in 2009 after his mother passed away, who was originally from Carcross/Tagish First Nation. The familial connection to Carcross continued through the carpentry training program, as he worked alongside several of his cousins. Thompson was one of 15 students ranging from 22 to 56 years of age in the carpentry training program — three of whom were women and four of whom were his cousins. The classroom component of the program focused on construction-related content, including safety, layouts, blueprints and mathematics. Participants began to share their skills. “We all kind of helped each other. There was a person who couldn’t read too well so I’d help him so he succeeded and was happy,” Thompson recalls. Thompson now works in the infrastructure department for Carcross/Tagish First Nation, building decks and constructing ramps for elders’ homes. A piece of him remains with the tiny homes he has helped build. This is particularly true for one of them. Mere months after graduating the program, Thompson received some surprising news: one of the tiny homes he poured his efforts into would soon become his own. Thompson is the first and only resident to live in this bachelor unit. He graduated from the carpentry training program in 2014. The carpentry training program was initially conceived as a way to teach Carcross/Tagish First Nation members transferrable skills, but it was also a way to revive abilities that were lost within the town. The carpentry training project — which cost approximately $900,000 to run and was financed by Carcross/Tagish First Nation with contributions from the territorial government — was a way to re-instill construction skills in the community. But it also taught participants how to be on time, communicate with their colleagues and open up in group counselling sessions. The philosophy behind the project was later applied to the First Nation’s stewardship program, which has hired 16 people to assist with reclaiming and cleaning up the site of the former Chooutla Indian Residential School. For Antonio Zedda, an architect at Kobayashi + Zedda who designed the Steve Cardiff Tiny House Community and Carcross’ tiny homes, the capacity building element of the project was crucial to improving life in First Nation communities. “There’s a lot more opportunity here for First Nations to pursue their own goals as self-governing First Nations so that means that there’s been lot of requirement and request for capital development, like buildings and infrastructure,” he says. Zedda predicts that because of initiatives such as these, people will have the base education and experience they need within the next 10 to 15 years. Antonio Zedda reviews the blueprints from the first phase of the Carcross/Tagish First Nation initiative. Developing autonomy and new work skills is an important part of the equation, but at Blood Ties Four Directions Centre, executive director Patricia Bacon is focused on housing as a social determinant of health. Patricia Bacon stands outside the construction site for the Blood Ties Four Directions Centre's Steve Cardiff tiny home community. The project broke ground in May 2018 and will feature five tiny homes. She notes that while the Indigenous community sometimes has poorer health outcomes and therefore increased housing challenges, it’s critical to contextualize why that’s the case. “You have to understand that a lot of the people we are serving are people who are residential school survivors or children of residential school survivors,” she says. For Cory Thompson, his one-person tiny home is all he needs. His roommate — a three-legged Australian Shepherd mix named Kyla — acts as a guard dog for the little neighbourhood, which includes two elders, one of whom is his cousin. Thompson has built Kyla a small dog house and plans to match the orangey-brown siding to that of his own house, which comes with a monthly rent of $300. Aside from a lumpy mound in his side yard created by his septic tank, dreams of a cedar fence to enclose his lot and the odd storage struggle, Thompson wouldn’t change a thing about his tiny home. Even so, he’s still a little envious of the solar panels installed on the newer tiny homes on his cul-de-sac, which are currently being built by an outside contractor and Carcross/Tagish First Nation members. Now, four years after graduating from the carpentry training program, Thompson says he’s grateful for the professional skills the program helped him to develop, but also some personal ones: humour and patience. Personal effects are few and far between in Cory Thompson's home. 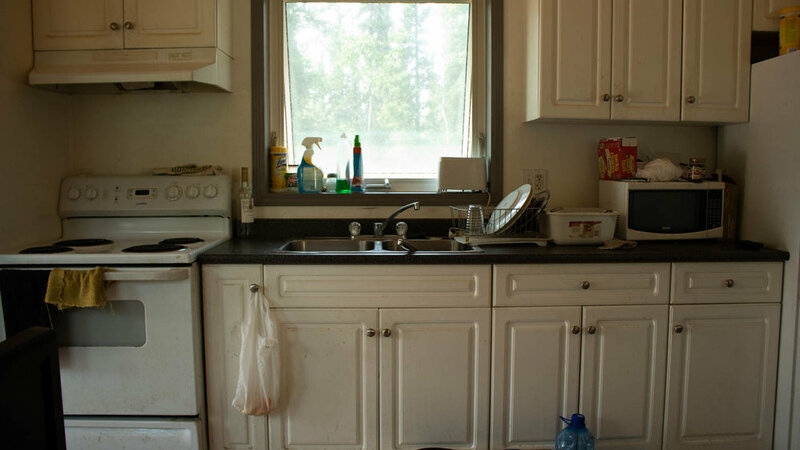 But even Kyla — Thompson's loyal companion — has a designated place to eat in his tiny home. If Thompson’s occasional frustration with his limited space is any indication, tiny homes are not a viable solution for everyone facing housing challenges. Bacon does not recommend the model for single women with children, families or couples, given the size of the units. So far in Whitehorse, the model is working best with single men. Zedda says that while Bacon kept modesty in mind when envisioning the Steve Cardiff houses, some Carcross/Tagish First Nation members had many thoughts on expanding. Besides being outfitted with solar power systems, the new homes in Carcross are getting bigger. “The impetus for the design changes all came from the First Nation,” he says, adding that some wondered if walls could be expanded or whether another bedroom could be added. “We still have a palette of all those original designs that are still there, but we’ve complimented those with a whole bunch of different variations. And they’re all in the range of tiny to not-so tiny houses,” Zedda says. James Smith, the First Nation’s director of infrastructure, agrees, saying that the original three homes in Carcross were specifically designed for single occupants or elders looking to downsize. Bacon, however, believes it’s not just the size or concept that needs to be considered; it’s also the length of time someone will live in the home. The original Steve Cardiff house was meant to temporarily house tenants for three- to 12-month stays. “We thought that a person could move a lot on the wellness continuum in the course of a year. But what we learned was 12 months is actually not that long for a lot of our clients. Most of them were just getting stable, just getting comfortable with being housed and settled in,” says Bacon. The units in the new tiny home community will not come earmarked with a departure date in mind. So far, the project has cost Blood Ties more than $300,000 just to buy the land and demolish the house that previously stood there. This year, a number of tiny houses across the Yukon will become tiny homes. Carcross/Tagish First Nation residents are set to move into four new tiny home units later this summer, around 400 to 600 square feet in size. Back in Whitehorse, the four new Steve Cardiff tiny homes - around 240 square feet in size - are taking shape. The foundations, walls and frames are in place and Bacon is optimistic that the spaces will be completed by the fall. These alternative housing strategies have made their mark on the housing market in the Yukon, but Mechan says it’s just the tip of the iceberg. “There’s definitely more of an urgency in the community than there’s ever been. New partnerships evolving come with complexities and challenges. A lot of trust building is going to happen,” he says. As for Thompson, his return to Carcross/Tagish First Nation has meant gainful employment, new friends and a sense of gratitude. "My three-legged dog, that's her neighbourhood and she protects her elders," says Thompson. "If a strange car comes – boom – she’s down there. And I didn’t teach that."